Thanks to Debbie Jacobs and Randi Rossman for their input on this topic. Any weird conclusions are mine alone. I have come to believe that most of us who thought we were using “choice” as a reinforcer were mistaken. Wait! Before you come running after me with pitchforks, let me explain. I’m not saying that choice isn’t a wonderful, enriching, and humane thing to provide for our dogs. It can be all that! Rather, I’m concerned about the trend of glomming onto attractive-sounding language without proper analysis of what is actually happening. The problems attending that go a lot further than nomenclature. They can affect the quality of our dogs’ lives. I’ve written before about misunderstandings regarding choice, but this is the biggest misunderstanding of all. When we say that choice can be reinforcing we may be technically correct, according to some studies, but we are probably not using it that way ourselves. Let’s analyze it. Where was the choice in this description/analysis? Let’s say she chooses the other option. How about this one? Context: I always let my dogs walk away from a toenail trimming session whenever they want. The choice was between behaviors and it was offered in the antecedent. In all of the scenarios above, and almost anytime we are talking about “offering” the dog a choice, giving the choice is part of the antecedent, not the consequence. We set up the environment (antecedent) so there is more than one possible, hopefully pleasant activity (behavior). The consequence is the reinforcer for the chosen behavior. In the above scenarios the reinforcers were a low value treat, grass, and escape. This kind of choice can’t be a reinforcer, at least not of the behavior we are analyzing. And a reminder: as I mentioned in a previous post, the animal always has a choice about their behavior, whether we want it to be there or not. As we train a behavior to fluency and consistency, we are actually trying to prevent the possibility of the animal making other choices. OK, perhaps I have convinced you that the choices we offer are usually in the antecedent. “Would you like to do this, or this?” So instead, can we create a different scenario where the dog needs to perform one particular behavior correctly but then has a choice of two different reinforcers? That scenario at least has the potential of the choice being part of the consequence. Here is how I would go about that. Let’s say I’m going to ask my dog Clara to perform a sit. A couple of feet away from her I have her red rubber ball and a favorite toy, with a little space between them. What role would the choice after the behavior perform? In this case, I believe very little. The ball and the toy would each have a much stronger and more direct effect than the fact that the dog got to choose. The choice aspect would likely be overwhelmed. When scientists study choice as a reinforcer, they have to go to great lengths to separate its influence from the obvious reinforcer of the animal’s behavior–the thing the animal chooses. They have done it, including in a series of studies I described in another post on choice. Even if we agree that choice itself had a reinforcing effect (and not all scientists do agree), the work they had to perform to isolate it means it just is not going to get isolated often in the real world. So can we separate out a possible effect of the choice part from these strong reinforcers? We could try. We could keep excellent records. In some trials, there would be only the ball. In others, there would be the ball and the toy (the choice scenario), but she only gets one. (We would also have to watch out for possible punishing effects of removing one item–most dogs would want both!) If Clara’s sit-on-cue response percentage was higher when both items were present, no matter which item she chose, we could claim that “having a choice” was a reinforcer. Not the only reinforcer or the strongest, but one with a possibly traceable effect. But in a home scenario it is almost impossible to control for all possible reinforcers and other competing stimuli that could make the scenarios non-identical. I think even in the best attempt at a clean experiment, we probably wouldn’t be able to say that we demonstrated at home that choice was a reinforcer. I’m starting to flinch a little bit when people talk about choice being a reinforcer. When it comes to their animals, how do they know? So here is the challenge. If you have been trying to use “choice” as a reinforcer, try these questions on for size. 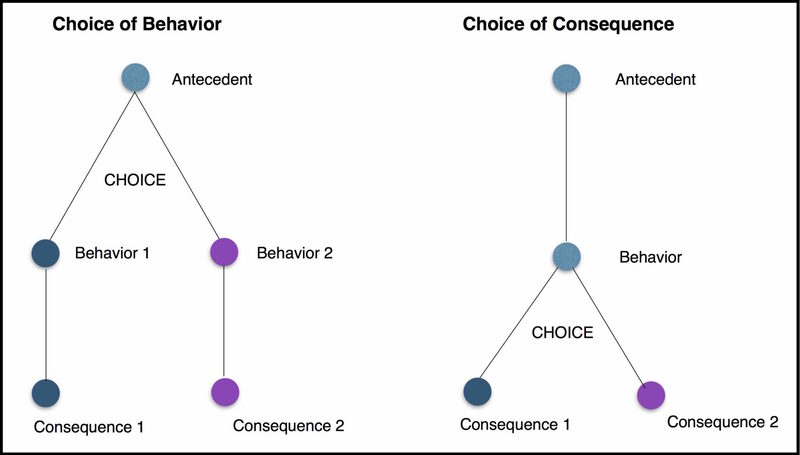 What behavior was reinforced by offering a choice? 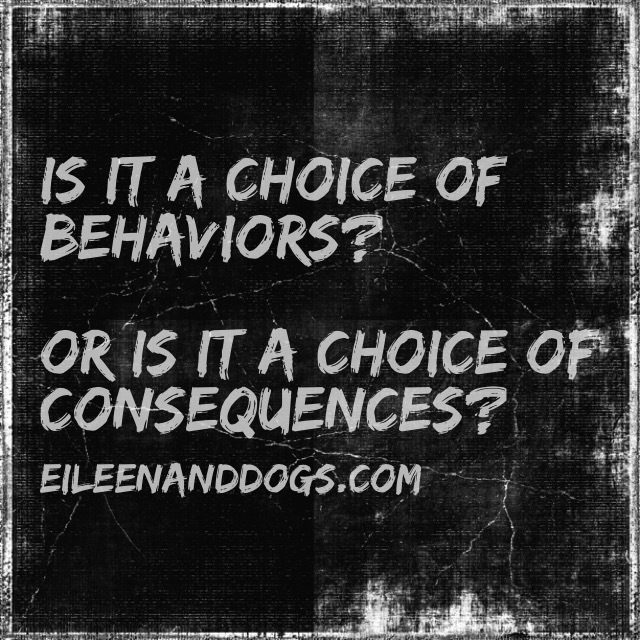 Remember, the choice has to come after the behavior for choice to be in the running as a reinforcer. How did you separate the effect of the choice from the effect of the reinforcer the dog chose? How did you track the data of the choice/non-choice situations? How substantial was the effect of choice? How did you allow for the possible aversive effects of removing an option when the dog chose the other item or activity? So maybe you aren’t using choice as a reinforcer. If, instead, you are giving your dogs lots of choices between behaviors, great! That’s wonderful. But that’s different from asking for a behavior and using choice as a theoretical part of the reinforcer. Why Am I Being So Picky? We all agree that offering our animals choices and freedom and the ability to exert their preferences are good, humane things. So why do I keep nitpicking about the language we use? It’s because when we focus on choice, we may turn our attention away from what is actually driving the animal’s behavior. 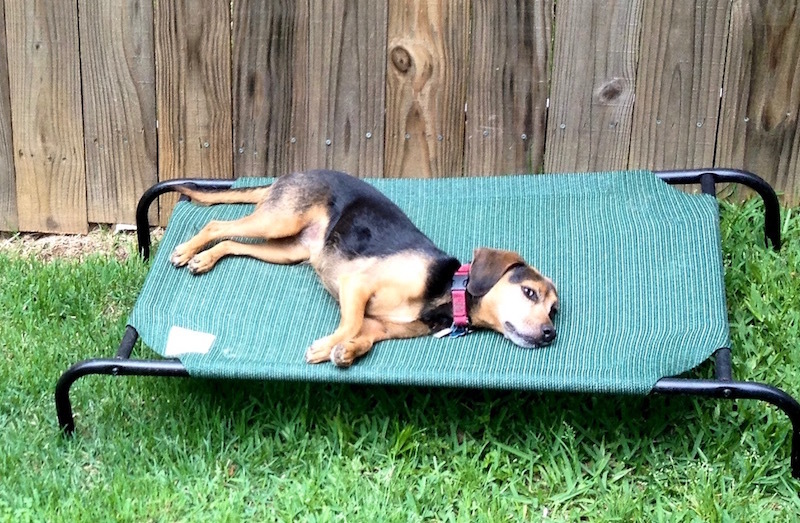 If I congratulate myself on how my dog is free to leave a husbandry session whenever she wants, I may neglect to notice that 1) I could be taking steps to make the session less stressful so she wouldn’t feel it necessary to leave; and 2) she is repeatedly practicing escape behavior–and practice makes perfect. I would far rather my dog take actual enjoyment from getting her nails trimmed and want to be there in the first place. I bet she would too. The ability to leave when she wants is essential, but is a sad, paltry, negative reinforcer compared to enjoying the activity in the first place. If it happens a lot, it’s an indicator that I should rethink my approach. Even when the choice is between two positive reinforcers, it can be unfortunate to over-focus on “choice” rather than the reinforcers themselves. For instance, I can pat myself on the back for giving my dogs the choice to be inside the house or out in the back yard, both of which have reinforcers available. Yay, choice! But I can tell you right now that any of my dogs would rather go on a walk down to the corner of my street where the pee-mail is so fine. On that walk our actions would be structured and the dog would be on a leash. Leashes are usually choice limiters. The dogs would be far less free to choose on the walk down my street than they are when they are in my back yard. But the sniff-fest that would be available when we got to the corner (not to mention the one on the way) is so hugely interesting that it would dwarf most “choices” they have in the back yard. In this case the “less choice” situation would have richer reinforcement than the “more choice” situation. Finally, the exploration of choice leads us into constructs. We can get focused on teaching our dogs a special way to say yes or no, for example. That can be a cool thing to teach, but I think there’s something more important for us to learn. Our dogs are telling us “yes” and “no” in their own ways all the time. We just need to pay attention. Requiring the dogs to learn our language, to say things the way we want them to, may even reduce choice if it means we pay less attention to what they say in their own ways. It means we have put the onus on them to learn our language rather than the other way around. Anybody up for the choice challenge? Can you separate out reinforcing effects of choice on a behavior? « Teaching the TrickMeister Way!